In order to conduct real estate activities in South Dakota you must have a South Dakota Real Estate Associate Broker license or responsible Broker license. The South Dakota Real Estate Broker Exam is split into two parts. 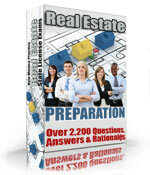 The first part is the real estate broker multiple choice exam and the second part is the simulated response exam. Each part must be taken in different sessions. The multiple choice portion of the South Dakota Real Estate broker exam is comprised of 140 questions. In order to pass the exam an examinee must answer 105 out of the 140 questions correctly to pass (75% correct). The time limit allowed for completion of the Real Estate Broker multiple-choice portion is 3.5 hours. The simulated response part of the South Dakota Real Estate Broker Exam is comprised of 10 problems. In order to pass the exam you must score at least (75% correct). The time limit allowed for the simulated response part of the South Dakota Real Estate Broker Exam is 3.5 hours. The South Dakota Real Estate Broker exams are taken on computers. You will receive your results immediately after finishing the exam. The exam is closed book. You are permitted to bring a simple functioning calculator for the 10% of the exam questions that might involve math. The registration fee to take the South Dakota Real Estate Broker exam is $95.00 whether you take one or both parts of the exam. The retake fee is also $95.00.